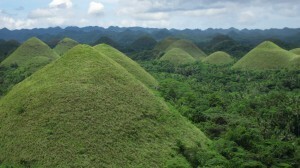 Our 120 kilometer motorcycle ride through Bohol, The Philippines to see the Chocolate Hills didn’t go exactly as planned. Mostly we hadn’t discussed that morning any intention to crash into a ditch. The story itself isn’t that exciting. At about kilometer 70 there was a switchback in the road, it was slippery and next thing we knew, we were doing a close inspection of the soil composition of the neighboring ditch. We were incredibly lucky. We had a few bruises and scrapes, but most of the damage was to my pride. Luckily, when people ask what happened, I get to say “motorcycle crash” which is much better than “I stuck my hand in a fan” which was my refrain while traveling through Argentina in 2005. 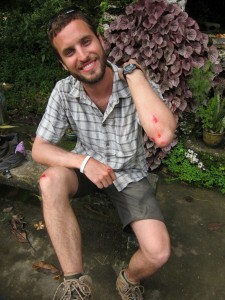 Most of the locals could guess the cause of my injury before I told them suggesting these types of accidents are pretty common in The Philippines. And the nice ladies at the side of the road where we crashed, thought this was so common that they didn’t even bother to stop their conversation or get up as we plowed into the ditch or during the ensuing clean-up. 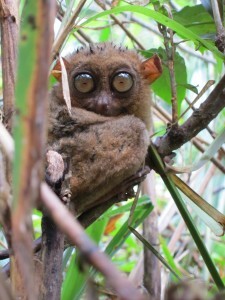 We dusted ourselves and motorcycle off and continued our ride to see the Tarsiers, strange mini-Ewok like creatures that used to be the squirrels of Bohol before domesticated cats decided they were toys and enterprising store owners started putting them in cages. Despite our unintended stop, we had a pretty amazing day. To my parents, who told me never to ride a motorcycle — what they often referred to as a donor-cycle — thanks for giving us a soft landing and point taken. That sounds like a prudent thing to do. We haven’t given up on them, we rented one to visit a waterfall the other day. You’re lucky it was a dirt road. I assure you (and my scars back it up) that asphalt isn’t that forgiving. Glad you both are okay! Very, very lucky. Asphalt would have been far less pleasant.